I am wearing this costume. Almost all of it is handmade. I started off with an old pair of jeans that I took some scissors to and ripped them in different places. Then I bought a plaid shirt for the top of the costume. I put on boots with it. Then I found a "Wizard-of-Oz" do-it-yourself scarecrow kit online which consist of straw that is attached to a ribbon, that you tie around your neck, both wrists, and both ankles. The cost of that was $6.90 before tax. Then I purchased a hat I found on Wal-Mart for $12.99. I found a piece of clothesline and tied that around my waist. 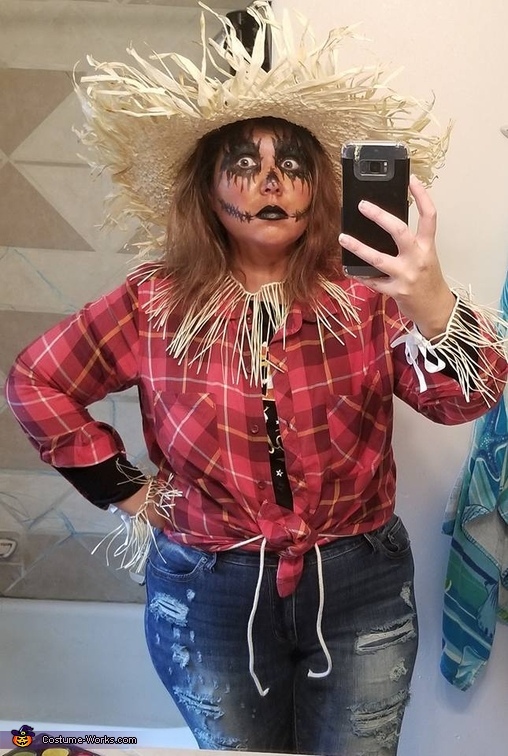 The halloween make-up was purchased at Wal-Mart for $4.99. I used a brown color to smudge all over my face, and then applied splotches of green and yellow to bring out the color of the straw. The black around the eyes, lips, and mouth was done with black eyeliner. I received tons of compliments on this costume and it was really fun to wear! !